Quick, accurate 1 second infra-red reading. Contains a travel pouch for safe keeping. Easy to use, soft operation keys so as not to disturb a sleeping infant. 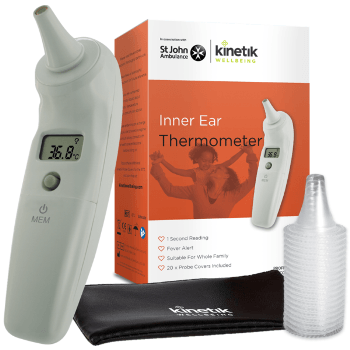 The Kinetik Wellbeing Inner Ear Thermometer is a safe and easy way to take a temperature, an important health measure, particularly in children. It detects a high body temperature to help you identify illness and understand whether fever reducing medication is required and then also working. Insert batteries into device and remove protective cap covering probe. Turn on device, use probe cover and insert thermometer into ear. Press and release scan button to take measurement.